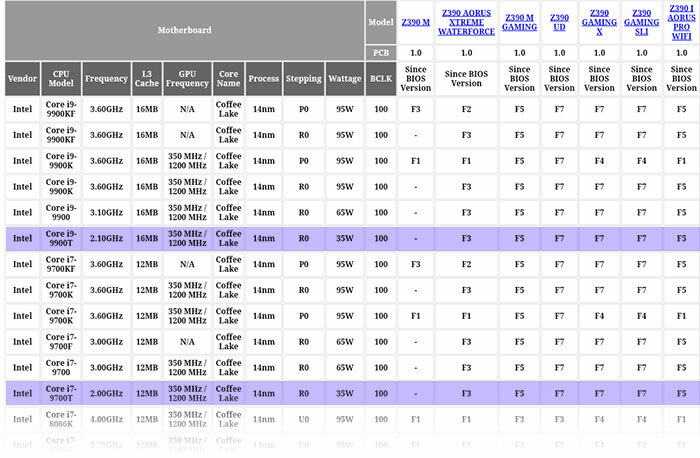 Back in early March HEXUS reported upon the leaking of the Fujitsu Coffee Lake Refresh motherboard compatibility list. An unencrypted PDF was accidentally left on Fujitsu's public servers which included previously unannounced processors from Intel, namely new Coffee Lake T-series desktop chips. Unfortunately the list didn't include much information, other than the names and TDPs. A few hours ago some more detailed information with regard to the upcoming Intel Coffee Lake T-series was put together using a couple of newer sources; Northwood Japan, and Momomo Twitter - via NoteBookCheck. As a refresher, Intel's upcoming Coffee Lake T-series will all arrive with 35W TDPs, whether they sport 2, 4, 8, or even 8 physical cores. Fujitsu's motherboard compatibility leak indicated that there would be T-series chips in the Celeron, Pentium, Core i3, i5, i7, and i9 ranges. All the new T-series Core ix processors will feature the UHD 630 iGPU. Importantly, to achieve the desired 35W TDP, base CPU clock speeds have been greatly reduced compared to similarly named but differently suffixed desktop parts. From the above bullet point list, consider the i7-9700T, for example. This new variant of the popular Core i7-9700K (and i7-9700KF) is said to offer a base/turbo frequency of 2.00 / 4.30GHz, while its bigger 95W brother offers 3.60 / 4.90GHz. Of course there are performance impacts for this low power trade-off. 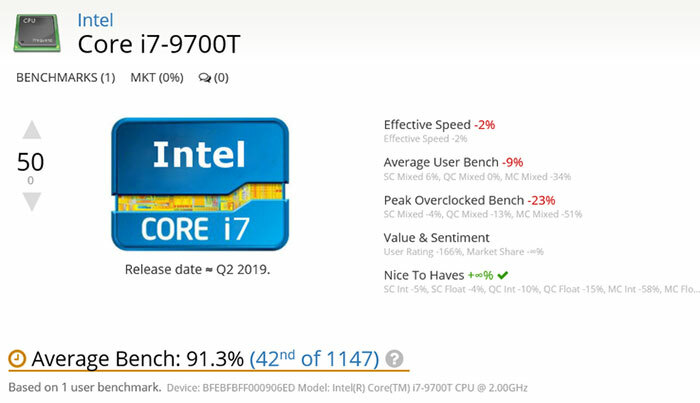 Recently unearthed benchmarks from UserBenchmark show a Core i7-9700T sample scoring an "outstanding" 91.3 per cent. This score is on a par with the 65W Core i5-9400F. However, it slips somewhat with reference to the 95W Core i7-9700K chip which garners 113 per cent in the same tests. EDIT: Now I've read the article, I am getting more frustrated with these stupid naming “conventions”. You can not make out this is comparable to a desktop chip of a purposefully similar name. The base clock is down by 1/3rd! There'll be a turbo but that Tau value will be very short due to the thermal constraints of the chassis. Unless you do some really deep research so you know what you're dealing with before purchase, you're gonna feel conned.